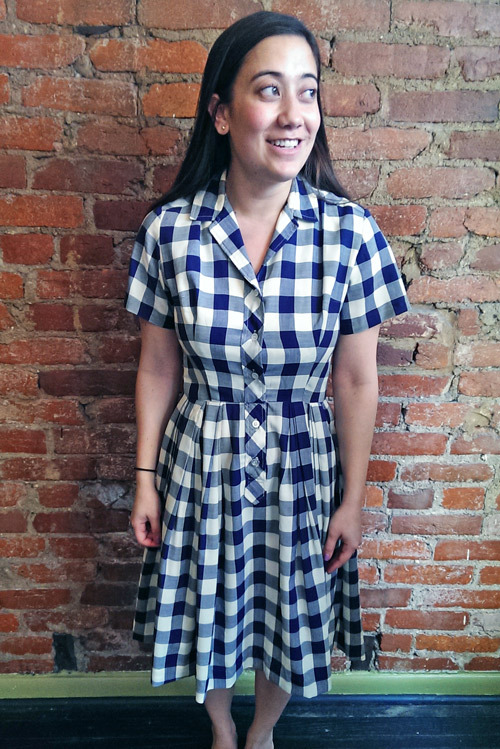 Mallorie had this adorable little vintage number in her collection, the problem is it came to her with some major rough spots. 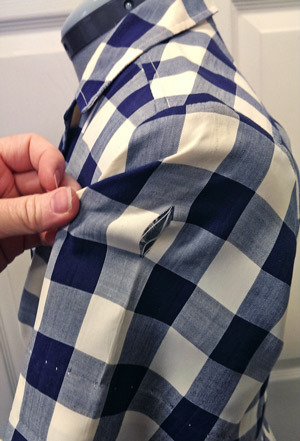 The fabric definitely looks like it has weakened over the years–there was a gaping hole in the armpit, with a hastily repaired armpit to mirror the other side. In addition, there was also a slice in the sleeve and side seam. 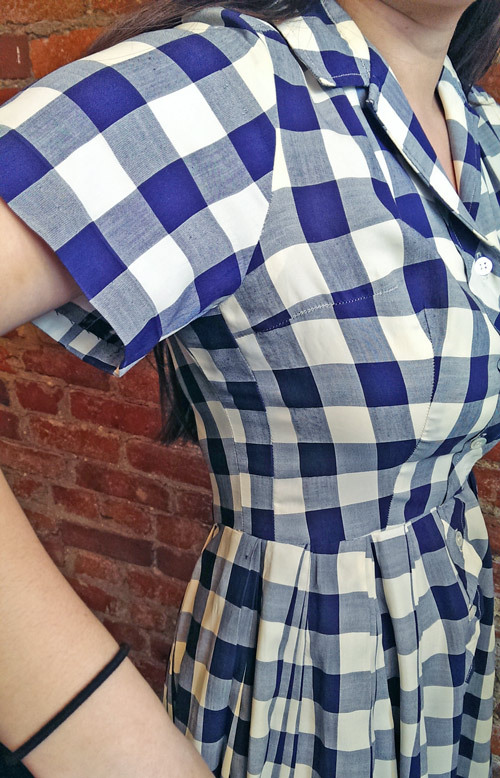 Once Mallorie tried on the dress, we realized it was too tight for the weakened fabric. You may wonder why we didn’t just give up on it, but we both understood that a dress like this was worth rescuing, no matter what. I started things off by letting out a back pleat to give her more room through the waist. I then re-cut/hemmed the sleeves through the top of the shoulder VERY CAREFULLY-the fabric was only going to give me one chance to stitch this on since the previous stitch line weakened the fabric as well. I stabilized several holes and backed the arm hole with additional fabric for strength before putting the sleeve back in place. Re-cutting the sleeve this way, made it too tight in the armpit, so to hit 2 birds with 1 stone (and since we decided to hem the skirt and had fabric to work with), I added a stripe to the sleeve that continued down the side seams to hide all of the other holes. Another dress rescued! Do you have a vintage piece that needs some special attention or creative thinking? 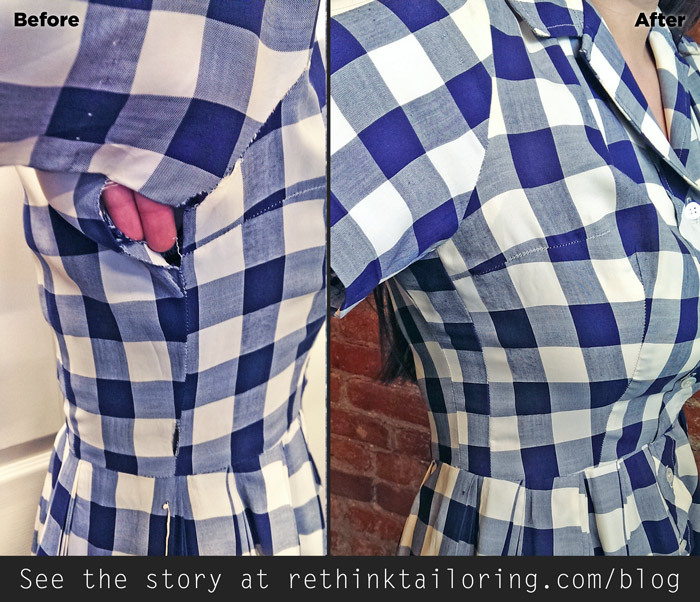 Email me about it at kristen@rethinktailoring.com and we can brainstorm a solution.